All transactions are safe and secure with a reliable history in online purchasing behind each of our associates. Buy the Disney Camp Rock Cast t-shirt to own Camp Rock clothing and merchandise. 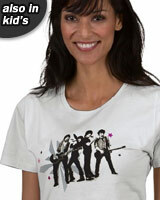 Embrace your retro side and add this stylish design to your collection of Camp Rock clothes. The design, available on a variety of garment styles, features the movie characters Jason, Mitchie, Shane and Nate, striking a pose as they perform. Strike similar poses with your Mitchie and Shane Camp Rock singing dolls that include accessories like microphones and a guitar. If you're too old for dolls, sing along to the Disney Karaoke Camp Rock CD that includes a "This Is Me" karaoke version. In addition to the Disney Camp Rock Cast tee above, browse the Camp Rock Clothing Gallery for more apparel like men's and women's clothes, kids shirts or hoodies.